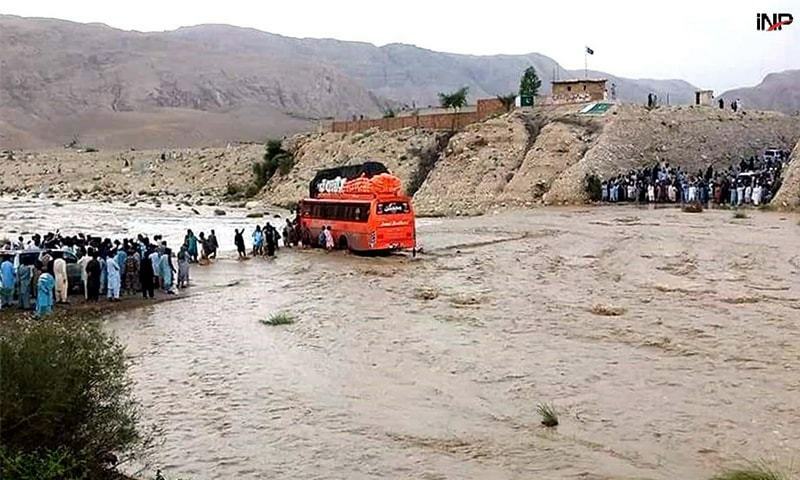 QUETTA: Around 150 Hindu pilgrims, who were stranded in a flash flood following heavy rains in the Kachhi area of Bolan district, Balochistan, were rescued by the personnel of Pakistan Army and Frontier Corps on Sunday. The devotees, hailing from Balochistan’s Nasir­abad and Jaffarabad cities and Sindh’s Jacobabad city, were en route to Kachhi on camels to celebrate the Baisakhi festival, a spring harvest festival, when it began to rain heavily. Unable to go further because of flash floods which developed following the torrential downpour they sought refuge in nearby mountains. When their relatives were unable to contact them, they were feared missing. Their relatives immediately got in touch with the local administration who then contacted the Army and Frontier Corps. Moreover, Balochistan Chief Minister Jam Kamal Khan asked authorities concerned to make use of a helicopter belonging to the provincial government for the search and rescue operation. Army and FC rescue teams along with the local administration reached the site and rescued all including women and children. The Provincial Disaster Management Authority provided them with food, water and other relief goods utilising the helicopter. They were later shifted to the Shoran area of Bolan district. “All pilgrims were found safe and sound and transported to their native towns by the local administration with the help of Army and FC personnel,” said Deputy Commissioner, Mir Sultan Bugti.